The A-Te does a fine job of filling Chumphon’s midrange price bracket with cushy rooms, polite staff and a large swimming pool. Ad Book now! Rates from US$62.32++. Average rating 8 from 1,068 reviews. Accessed by a lift, rooms stretch for some distance behind reception in the four-storey concrete building backed by the pool, a bar and fitness centre. Rooms are spacious, bright and sleek, with hardwood touches, long desks, sloping wood chairs, floor-to-ceiling windows and soft linens on soft beds. Spacious and modern bathrooms have showers partitioned behind glass with a couple of different showerheads. All rooms come with air-con, LCD TV, WiFi, fridge, safe and coffee/tea facilities, while the higher-end rooms have bathtubs and large pool-view balconies or direct pool access through sliding glass doors. Both the uniformed receptionist and bellhop were very polite to us. The value is pretty standard for the quality -- perhaps a smidge pricey for a town like Chumphon. A-Te is located about a kilometre south of the train station and an easy walk west of the Municipal Market. A coffee shop fronts the large car park, and Prikhorm Restaurant is located next door. 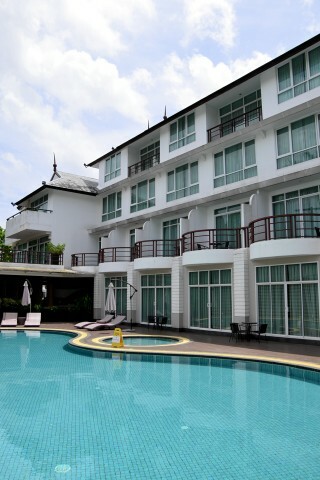 In the centre of town, the Morakot Hotel is larger and older with standard Thai business-style rooms starting at 900 baht. If you have a vehicle, Tanisa Resort and Chalicha Resort are a couple of quiet options with comfortable rooms for around 1,000 baht on the outskirts of town. Check rates at A-Te Hotel on Booking.com.